POSTED August 2, 2018 12:44 p.m. Outdoor media veteran Mark LaBarbera has agreed to team up with SWNews4U.com as we increase coverage about all things outdoors for subscribers online and in print. We will begin publishing and posting his words and images of interest to you and others in our area who care about nature-based activities, people, places and issues. Mark lives here in Southwest Wisconsin, was the first life member of the Grant County Outdoor Sports Alliance, is Treasurer for the Natural Resources Foundation of Wisconsin and serves as a Lafayette County delegate to the Wisconsin Conservation Congress. He also was appointed and serves on the Wisconsin Sporting Heritage Council. His volunteer time includes running the Midwest Outdoor Heritage Education Expo attended by nearly 3,000 fourth-through-seventh graders each May. Schools from this area and across southern and central Wisconsin attend the annual event which Mark launched five years ago. It is owned and operated by the Outdoor Heritage Education Center organization he founded 20 years ago. He remains its lead volunteer. If you’re involved with youth fishing programs, learn-to-hunt events, school archery and trapshooting, or sporting conservation groups like Trout Unlimited, Whitetails Unlimited, Quality Deer Management Association, Pheasant Forever, Izaak Walton League of America, Wings Over Wisconsin, Friends of NRA, National Wild Turkey Federation, Ducks Unlimited or local clubs, you might already know him from banquets, committee work or volunteer meetings. He and Dan Small produce “Deer Hunt Wisconsin,” “Wild Turkeys in Wisconsin” and “Pheasants in Wisconsin” TV specials and videos. But his experience, adventures and accomplishments reach beyond our borders. More than being an avid hunter, angler and conservationist, he is also an award-winning writer, producer, editor and photographer. 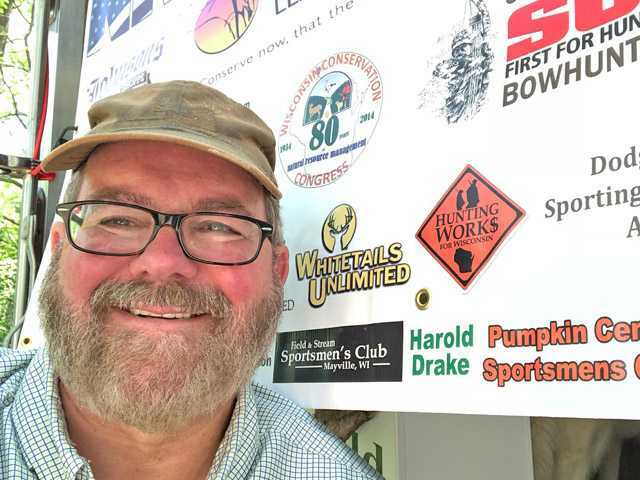 Mark is Past President and former Chairman of both the Outdoor Writers Association of America and the Association of Great Lakes Outdoor Writers. They gave him many awards over the years, such as the Golden Glow Award for service to conservation. Previous winners included Aldo Leopold, Sigurd Olson and Senator Gaylord Nelson. He is also an active member of the Wisconsin Outdoor Communicators Association. He was one of only five national finalists for Budweiser Outdoorsman of the Year. In 2016, he was honored by the Wisconsin Society of Science Teachers with that year’s Friend of Science Education Award.